On this Veteran?s Day, I am reminded of a few things from my own brief history on this earth. My father always said history repeats itself, and now I realize why? because people choose to forget, or want to forget the past.? I am reminded of the years after 9/11, that dark time in NYC when I was a freshman in college and living through that fear and darkness.? Despite the darkness, New Yorkers and the world came together for healing and rebuilding.? Despite that light in the darkness, fear crept up into our lives and some people lashed out at the Muslim population.? Some of my friends were followed in a car and were being threatened just because they were Muslim and there were so many more stories like that happening all over the country.? That fear of ?terrorism? incited a war with Iraq over weapons of mass destruction.? That fear caused us Americans to relinquish some of our fundamental rights when the government passed ?The Patriot Act?, allowing the government to have the right to spy on its citizens.? Benjamin Franklin said, ?Those who would give up essential Liberty, to purchase a little temporary Safety, deserve neither Liberty nor Safety.?? Yet we didn?t revolt then, and we watched as many brave soldiers fought and many were killed in that war, and in subsequent wars in the Middle East.? That wound of war continues to fester and fester in that region with too many innocent lives shattered in the process. In the midst of that darkness, I experienced a moment of hope that I wanted to share. President George W. Bush had just been re-elected for a 2nd term in November of 2004.? I was in Europe at the time, studying abroad but had mailed in my ballot voting for his opponent.? I was going to Paris for a trip since I had never been and everyone including the media said, ‘don?t go to France because the French hated Americans’.? French fries were being called ?Freedom Fries?, and I didn?t quite know what backlash to expect since it was right after the election.? However, I had never been to Paris and didn?t want fear of the unknown to drive my decisions, so I took a chance and went.? The first day in Paris I got lost and couldn?t find the train.? There was a woman on her way to work who stopped everything and helped me and my friends find the train.? ?She literally walked us there herself though she was on her way to work.? I was caught off guard by her kindness since I was under the impression that they hated us.? And then I was on the train and speaking English with my friends when an elderly man looked right at me and yelled, ?You Americans voted for Bush.? How could you!? I turned to him in shock, not sure at first if he was speaking with me. I then proceeded to tell him that I hadn?t voted for Bush but that I understood why the country did.? We then got into a dialogue about what I had experienced during 9/11 and the sadness and terror that it inflicted on our country.? It was a peaceful discussion and the elderly man shook his head in acknowledgment and understanding.? A woman got up and turned to me and said, ?I wish I was staying on this train longer to hear more about this.? Our media doesn?t give us that side of the story.? That is something I will never forget.? Some wars are not fought with bullets and guns and hate.? Some wars don?t have to be wars at all.? The people that you hate or think hate you can unite and come together in healthy dialogue and walk away, still having their beliefs and opinions, but being a little wiser hearing the other side of the story. We came together then and we will come together again and we will continue to fight for what we believe in. That is the beauty of this country and having the freedom to choose and congregate and speak our minds freely and openly for open discussion and dialogue.? That is the beauty of what makes this country great and what our veterans have fought and died for these past 240 years of our country?s history.? That the people can have a say and vote for their leader – that a woman can run for president and one day break that glass ceiling – that the underdog can still come out victorious – that change can happen.? We need to stop living in the dark and keep thinking for yourselves and work together to bring about the reform that this country needs no matter what?side of the political spectrum?you fall on. ?It?s through having these conversations and not being manipulated by fear that will continue to strengthen our country for years to come.? Remember, what the establishment fears the most is the fear that they are not able to control you- the people. In the words of the Preamble of the United States Constitution: ?We the People of the United States, in Order to form a more perfect Union, establish Justice, insure domestic Tranquility, provide for the common defense, promote the general Welfare, and secure the Blessings of Liberty to ourselves and our Posterity, do ordain and establish this Constitution for the United States of America.? 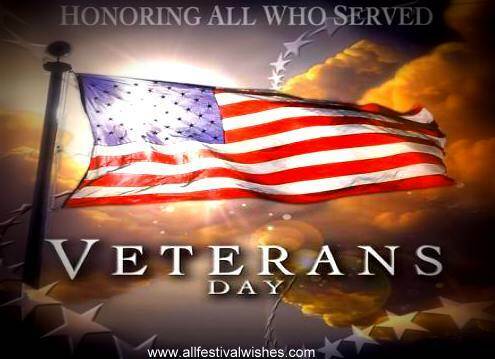 God Bless America and all our Veterans!